Gauteng « What Happened to the Portcullis? 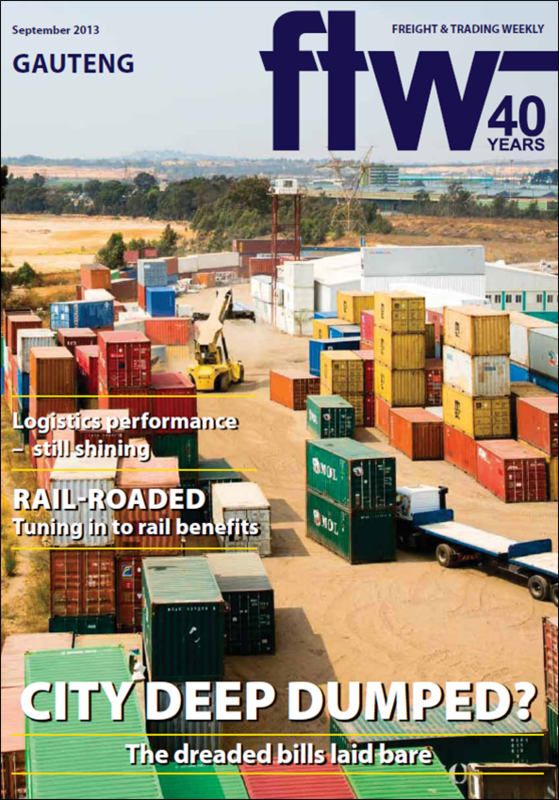 The latest Freight & Trade Weekly (FTW) [Gauteng special edition] publication reminds me of a very interesting article I read a few months back – refer to my post “What are surfaces?” of 23 June 2013. The article dealt with the question of surfaces (i.e. land and sea) in relation to the multimodal movement of containers and envisioned by the logistics and supply-chain management practices. I bewailed the fact that the actual dissertation would set me back a US$1000 but remained intrigued by the content which such dissertation would contain given the very interesting abstract I had just read. Given the high cost of such, obviously acknowledging the expertise, knowledge and resourcefulness which often goes into the preparation such papers therefore puts them beyond the reach of most. To my amazement, a few days later I received an email from a fellow blogger – an expert in supply chain logistics – who was happy to share with me his copy of the paper. The paper is titled “Shipping container mobilities, seamless compatibility, and the global surface of logistical integration”, published by Environment and Planning (EPA) volume 45 (2013). The author, a Dr. Craig Martin has delivered a masterpiece (my view) which considers the subject matter way beyond what I, as a Customs and Trade specialist, would consider or envision. I thoroughly enjoyed his bringing together of historical and current concepts and principles (attributed to many experts and peers) in the matter of intermodal containerisation. Understanding the supply chain is a critical pre-requisite in the international Customs and Trade arena, at least since 9/11. In addition to the various WCO guides and standards, one needs to locate and digest papers such as this – and here I refer also to the many other websites, reference portals and publications of international experts in the global logistics and supply chain field. Integration focuses on interactions between various aspects of a supply chain and is defined as “a systems approach to viewing the supply chain as a whole, and to managing the total flow of goods inventory from the supplier to the ultimate customer”. From the late 1950s, management theory began to emphasize the importance of “how industrial company success depends on the interaction between the flows of information, materials, money, manpower, and capital equipment”. By the 1980s, the emphasis of the logistics sector’s control of company functions, including materials management, transport, storage, and information management, highlighted the importance and process of integration. During the mid-1990s, the notion of integration extended even further with the move towards supply chain management (SCM), where aspects of supply, materials management, distribution, and retail functions were placed under the control of a single company. The overarching ideology of logistics and SCM are systemic completeness and the management of flow. The movement of containerised cargo is a critical component of SCM, as it accentuates surface control through the integration of land and sea transport. As far back as the 1960’s, experts opined that “most types of liquids and solids may someday be moved in sealed containers interchangeable among road, rail, air, and marine transport. Advantages would include reduction in damage and loss in the time and cost of loading and unloading. Containers may prove to be the catalyst that integrates the various components of the transport sector which are now being independently planned, financed, and operated” – and this is exactly what is happening today. In 1953 Malcolm McLean developed the idea of transporting truck trailers on ships rather than on the congested highways of the US East Coast. His rationale was to overcome congestion by consolidating the transport system: at this time the truck and ship industries were entirely separate. He is ultimately credited for the invention of the modern cellular container we have today. Vital to structural integration was the standardized nature of infrastructure itself – enabling the coupling of a container with a variety of nodes. These include the design of container-cell vessels, the redesign of road haulage vehicles and railway rolling stock, the design of container handling vehicles in ports, the construction of large-scale dockside gantry cranes, the design of spreader bars, and not to forget the design of the container corner fittings – these are standardized across all of the equipment related above. So I guess what I’m trying to emphasize is that close on 70 years of continuous harmonization and integration in the supply chain logistics industry, specifically in regard to multimodal (door-to-door) containerized transport, as well as the substantive facilitation support accorded thereto by both the WTO and WCO, the basis of containerisation must surely be a consideration when applying regulatory control measures whether it be in the export leg or import leg of an international supply chain movement. The key enabler in a modern Customs environment is undoubtedly automated processing and no less automated risk assessment. Facilitation on the other hand is a tool whereby, in combination with risk assessment, Customs focuses on entities and patterns rather than transnational intervention. Unreasonable (and mandatory) termination of a multimodal movement destroys the benefits of containerization and will add costs and loss of competitiveness for traders. Our beautiful country can ill-afford this given burgeoning competition from our neighbours up north. Finally, The matter of regional integration is another aspect which needs in-depth consideration. 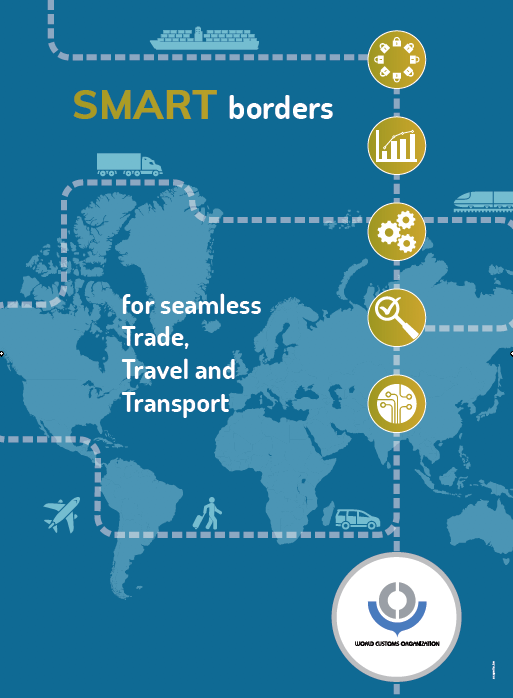 As we enthuse and wallow in our new found technological state, physical borders remain the biggest inhibitors to trade. More on this another time. Online media company Engineering News reports that the Chamber of Commerce and Industry Johannesburg (JCCI) would take its objections of certain aspects of the recently tabled Customs Control Bill to Parliament and called on South African business and interested stakeholders to provide input as well. The South African Revenue Services’ (Sars’) newly drafted Customs Control Bill, which, in conjunction with the Customs Duty Bill, would replace the current legislation governing customs operations, declared that all imported goods be cleared and released at first port of entry. “The Customs Bill, cancelling the status of inland ports as a point of entry, will be before Parliament very soon, and only a short notice period for comment is expected,” JCCI former president Patrick Corbin said. While all other comments and suggestions relating to the Bill were adequately dealt with, this remained the one disagreement that had not been satisfactorily resolved, he stated. Corbin invited all parties to voice their concerns to ensure “all areas of impact and concern were captured”, adding further weight to the JCCI’s presentation. The implementation of the new Bill would directly impact the City Deep container terminal, which had been operating as an inland port for the past 35 years, alleviating pressure from the already-constrained coastal ports. Despite customs officials assuring the chamber that the operations and facilities at City Deep/Kaserne would retain its licence as a container depot, Corbin stated that the Bill had failed to recognise the critical role City Deep played as an inland port and the impact it would have on the cost of doing business, the country’s road-to-rail ambitions, the coastal ports and ease of movement of goods nationally and to neighbouring countries. “The authorities do not accept the fact that by moving the Customs release point back to the coast, a vessel manifest will terminate at the coastal port. There will not be the option of a multimodal Bill of Lading and seamless inland movements, as all boxes or the unpacked contents will remain at the coast until cleared and released by the line before being reconsigned,” he explained. 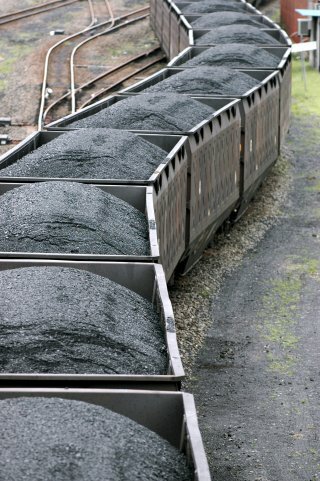 Citing potential challenges, Corbin said that only the containers cleared 72 hours prior to arrival would be allocated to rail transport and that those not cleared three days before arrival would be pushed onto road transport to prevent blocking and delaying rail operations. This would also result in less rail capacity returning for export from Johannesburg, leading to increased volumes moving by road from City Deep to Durban. He warned of the Durban port becoming heavily congested with uncleared containers, causing delays and potential penalties, while hampering berthing movements and upsetting shipping lines’ vessel schedules. The release of the vessel manifest at the coastal port also placed increased risk on the shipping operators delivering cargo to Johannesburg following the clearance of goods at customs and required reconsignment at the country’s shores. However, Transnet remained committed to investing R900-million for upgrading the City Deep terminal and the railway sidings, while Transnet CEO Brian Molefe had accepted the assurances from customs that “nothing would change and the boxes would still be able to move seamlessly once cleared”. The Gauteng Department of Roads and Transport Department had allocated R122-million for the roadworks surrounding the inland port, while Gauteng MEC for Roads and Transport Dr Ismail Vadi said the department’s focus this year would narrow to the expansion and development opportunities at City Deep/Kaserne. The department was also progressing well with the development of a second inland port, Tambo Springs Inland Port and Logistics Gateway, expected to be completed by 2017. 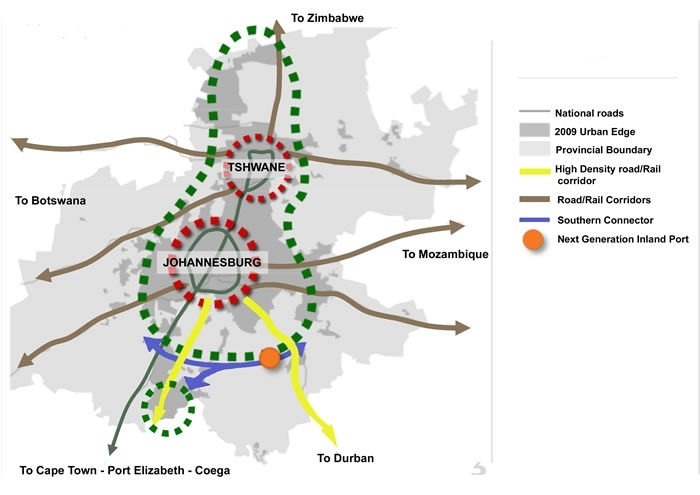 Vadi recently commented that the Gauteng Department of Roads and Transport, which was currently developing a terminal master plan for the project, would link the freight hub through road and rail transport to and from South Africa’s major freight routes and other freight hubs, including City Deep, which was about 33 km away. Transnet has concluded the first in a series of early stakeholder engagement sessions with local organisations on the proposed Durban dig-out port project. If built, the new port will be to the south of Durban on the site of the former Durban International Airport and 15 minutes by car from the existing port. It has been proposed that it will consist of 16 container berths, three Ro-Ro berths for the automotive business, and several oil and product tanker berths. The engagement sessions just concluded form an integral part of the project’s concept phase which includes the development of a Sustainable Port Development Framework (SPDF) that will inform all future designs as well as operations. Transnet commenced with high-level technical and environmental studies in 2012 as part of the proposed Durban dig-out port project process. The current concept phase is scheduled to conclude in July this year, and comprises the generation of a number of technical design options. The engagement sessions involved key representatives from local business, property, environmental and civic associations who met in order to comment on a discussion document which was distributed to them in mid-February 2013. The discussion document included important information on the background to, and process involved in, validating the viability of constructing a major container port on the site of the old Durban International Airport. The sessions were held at various public venues and were facilitated by an independent sustainability consultancy. All feedback obtained during the engagement sessions was captured and will be factored into the development of the SPDF which will ensure the effective implementation of sustainability objectives throughout the life cycle of the proposed port project. Along with promoting the long-term sustainability and operational excellence of the port, the framework also seeks to integrate environmental and social principles into the planning process. The series of engagement sessions, which will continue throughout the project’s lifespan, will also form part of the Department of Transport’s requirement for engagement during the strategic level environmental assessment as part of the legislative requirement for the promulgation of the port. The process of moving from the current concept phase through the pre-feasibility and feasibility phases, and finally to actual implementation is anticipated to take approximately four years. The next phase, which is the pre-feasibility phase, is expected to proceed in July this year when the viability of the preferred design option will be thoroughly investigated. Engineering News reports that Gauteng will require additional container terminal capacity by 2016, when City Deep, in Johannesburg, will reach its full capacity. Container movements to the province was projected to grow to over three-million twenty-foot equivalent units (TEUs) a year by 2020, she said in her Budget Vote address at the Gauteng Provincial Legislature. 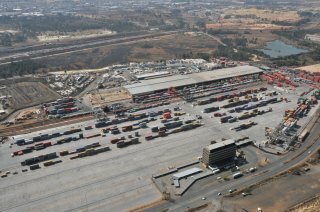 Gauteng’s intermodal capacity currently stood at 650 000 TEUs a year and comprised the Pretcon, Vaalcon, Kascon and City Deep hubs. Gauteng MEC for Economic Development, Qedani Mahlangu said the next generation of inland hubs would create an integrated multimodal logistics capability connecting air, road, rail and sea. Tambo Springs and Sentrarand, in Ekurhuleni, were identified to be developed into the new improved hubs. By 2018, Tambo Springs would handle 500 000 TEUs and will focus on economic development and job creation, among others. “Tambo Springs will serve as an incubator to stimulate the establishment and growth of new ventures, create opportunities for small, medium-sized and micro enterprises and create 150 000 new jobs,” Mahlangu said. She added that the department was working towards reaching an agreement with State-owned Transnet in September so that funding could be committed to start implementation by June 2013, for the first phase, which would comprise the railway arrival and departure terminal, to be completed by March 2014. While on the topic of port expansion, an acquaintance of mine reminded me of another development, right here in my backyard. He was referring to Inframax Holding’s proposed development of an inland mega-port and logistics gateway 25 km southeast of the Johannesburg CBD. The 630ha site identified for this project will be called Tambo Springs and is located on land originally known as Tamboekiesfontein farm. Gauteng is the largest metropolitan area in Africa, and one of the largest in the world, with a population of 10 million people generating the largest annual GDP in Africa. Inframax’s vision is to develop this site, and potentially add another 600ha, into a new inland port and logistics gateway that will contribute significantly to meeting Gauteng’s need to increase the current freight logistics capacity/throughput in and out of Johannesburg, to three million twenty-foot-equivalent units (TEUs) by 2015 and four million TEUs by 2020 – with further increases after that. According to locally born, Texas-based logistics consultant, Franco Eleuteri and Associates, the logistics challenges now faced in Johannesburg/Gauteng have cropped up worldwide wherever cities have expanded fast. Typically, the original logistics centres were developed on the city peripheries. Over the years, however, these cities grow and absorb the centres, making it difficult to expand or upgrade to accommodate new demands. This is basically what is happening to Johannesburg’s City Deep Terminal, which was established in 1977 as a bonded inland container depot where containers from Durban could clear customs in Johannesburg. City Deep still has a vital role to play but the time has come to have it operating in tandem with a larger inland port or ports on the new city periphery and able to accommodate a large efficient intermodal capability for road, rail and air transport. This is fundamental to any 21st Century freight operation. Tambo Springs is exceptionally well positioned as it is located in the southern periphery of Johannesburg and within the Johannesburg/Durban road freight and rail corridor. 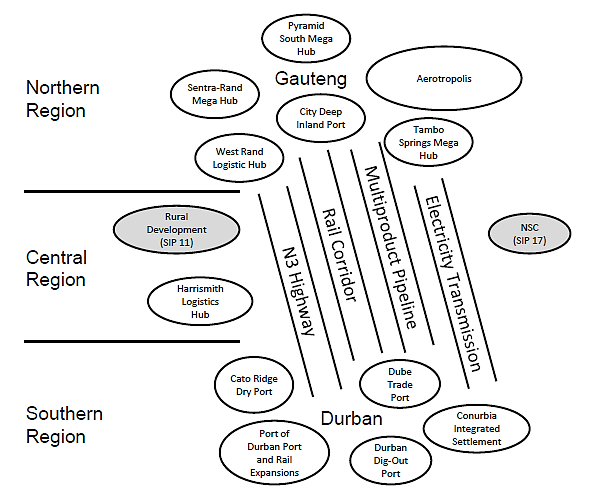 It has access to the N3 freeway to Durban (South Africa’s major freight transport route), to the N1 to Cape Town and via the R390, to Port Elizabeth and East London as well as to other freeways to the industrial centres just south of Johannesburg: Heidelberg, Vereeniging, Vanderbijl Park and Sasolburg, all of which are within 20 to 60km. 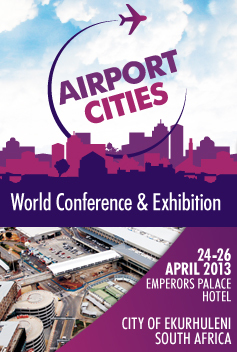 The site is also only 22km from the City Deep Terminal and 25km from the OR Tambo Air Freight Terminal. These excellent road linkages will allow the site to accommodate both full truck load (FTL) long distance road freight and less than truck load (LTL) regional distribution. On the freight rail side the existing dual directional links already run through the site to all the areas mentioned above. Accordingly, the Tambo Springs development can contribute significantly to optimising the country’s existing infrastructure, particularly that of the Ngqura Deep Water Port near Port Elizabeth. More optimal usage has the potential to increase this Eastern Corridor’s share of South Africa’s freight handling from about 14% to 21% in future. This is important given congestion at Durban harbour. Inframax has from the outset engaged with key public sector authorities and agencies to canvass in principle policy support for the initiative. These include Gauteng Department of Economic Development; Blue IQ; Transnet Freight Rail and Ekurhuleni Municipality. What is not clear, however, is whether or not Inframax has read the draft Customs Control Bill, which at this point would effectively create a barrier to such development. These are interesting times: a test as to whether business and trade ‘really’ determine economic and logistics opportunities, or whether policy makers have the vision to see the bigger picture.